The Springfield XDS is a pint-sized performer that many men and women are picking up as their favorite carry device. It’s small, but relatively precise and highly comfortable to shoot. It’s the type of gun that has made me reconsider my initial concealed carry purchase (spoiler it’s not an XDS), and it’s the type of gun that you’ll feel good having at your hip. See why the Outbags XDS IWB Leather Holster won our editor’s choice along with 3 other excellent options. Even a firearm as compact as the XDS needs a proper holster to keep it concealed and comfortably held in place. It’s not that easy finding a good holster, and most people aren’t going to try out a bunch of options like I have. Instead they’ll pick out one that looks pretty good, and try to live with it whether it’s the right option or not. Many will suffer with a subpar option for months or years before switching and that’s a really shame. Anyway, I’m serious about finding the best holsters, and so are the friends at my shooting range. I know a couple guys with XDS pistols and they’re constantly coming with new holsters they are trying out. They’re not the types to settle, and they have plenty of money to try out different options. This gives me the unique opportunity to try out quite a few different holsters, and I’ve formed an opinion on some of the options that I believe to be the absolute best available today, at least in the sub-$100 price range, which most holsters should fall in unless you like spending money. 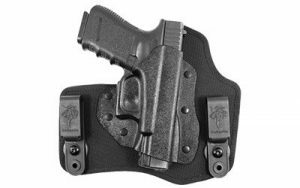 Below is a holster breakdown, listing off solid options for your consideration. Many of them I would own if I had an XDS, but instead I just get to try them out from time to time while looking for the very best options for my Glock. Comfort – There’s nothing worse than wearing an uncomfortable holster all day long. It rubs, chafes and makes you reconsider carrying a pistol at all. You’ll be asking yourself “What the heck was I thinking! ?” which is exactly why comfort is the most important consideration of all. If it’s comfortable to wear, you’ll instantly like the holster more, even if it has some other issues going on. Conceal-Ability – An IWB holster is usually used for concealed carry, so naturally it shouldn’t stick out like a sore thumb when you wear it. These options for the most part are easy to conceal, though some are bulkier and harder to hide than others. 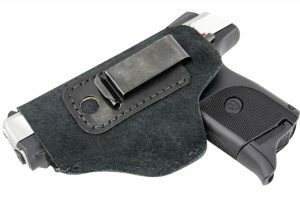 The Hold – A good tight hold inspires confidence while carrying a loaded firearm. You don’t want that beauty slipping out and falling down to crash off the asphalt. The best holsters all offer a secure hold that you can count on. 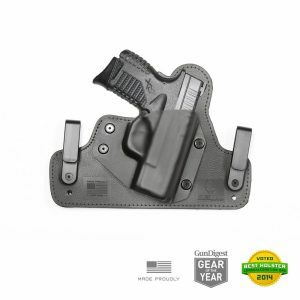 Cost Matters – Yes I know, you should pay for good quality instead of going for something cheap, but the thing is, you can get decent holsters at surprisingly affordable rates. You don’t have to spend as much as you did for your XD for the holder, and that’s why I don’t recommend overpriced items, because I wouldn’t buy them. This black leather holster from Outbags for the XDS is just what the doctor ordered! It’s compact and made from good quality leather that’s quite heavy, which is surprising for the price. 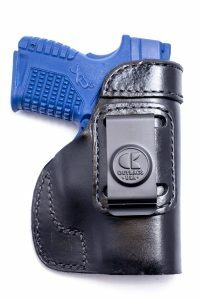 The holster is smooth and comfortable and after the break in period it’s even more of a pleasure to wear. Since it is a bit stiff your gun will be tough to draw and re-holster for a short time after making the purchase, but that issue dissolves away as the holster breaks in, just like any other leather product. 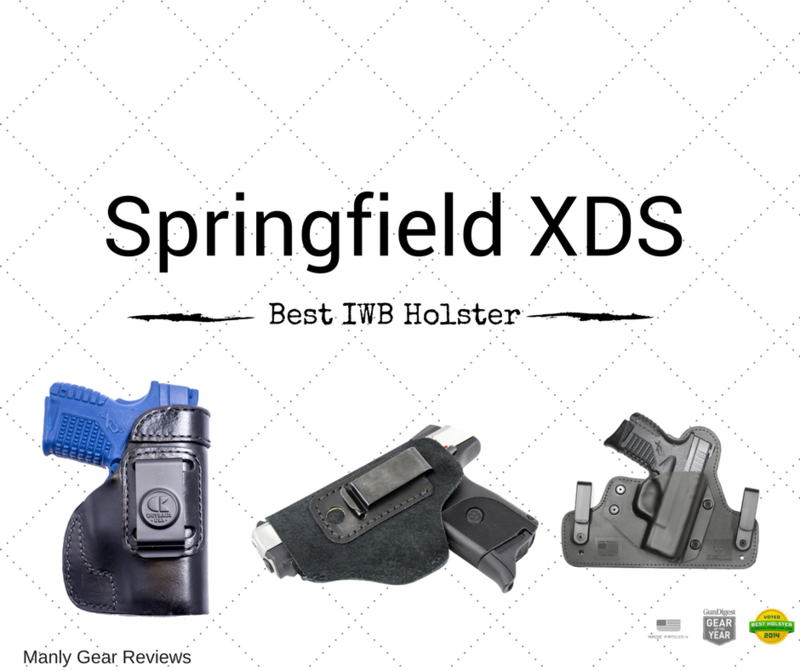 It’s a truly exceptional value, and one of the best low-cost holsters that you’re going to find for any pistol, let alone a quality one like the Springfield XDS. The Alien Gear Springfield XDS holster is a good solid alternative to all the leather options that are out on the market today. It’s comfortable and unlike with those leather holsters, you don’t have to go through that awkward break-in period with this holster. It’s durable and offers just the right level of hold, and the adjustable ride height makes it easy for you to get your firearm right at the level that’s most comfortable. It is one of my favorite options and a good non-leather alternative. Leather isn’t always the right answer when it comes to finding a good holster material, as this holster from Relentless Tactical proves with ease. It’s made from a faux leather suede that’s smooth to the touch, a bit thinner than standard leather and even more pleasant to have riding against your skin. The holster itself is very comfortable, but it offers a smooth and springy hold that allows a decently quick draw, but makes re-holstering a bit more difficult. The holster is more comfortable on a warm day than leather is, and it’s durable enough to stand up to regular use effectively. It doesn’t hurt that this holster is quite compact and easy to conceal, or that it has a mag clip included on the side of it to keep additional ammo nice and close by. The DeSantis Invader proves that you don’t have to spend a fortune to hold your gun firmly in place during a concealed carry. It’s very affordable, but made from decent quality leather and excellent craftsmanship. It won’t fall apart during use until long after the initial purchase, or at least that’s my impression after handling it and wearing it for a bit. The holster is stiff at first, but loosens just enough after that short initial break in period of a day or two. It retains the pistol very nicely with almost no wiggle at all. No matter what your price range is, this is a good solid product worth considering, and it’s become a daily carry option for many of my buddies, even one that owns a couple $100+ holsters!